A round-up of all improvements and changes to the Buzz platform in version 2.0.56 & 2.0.57, available on July 7, 2016. 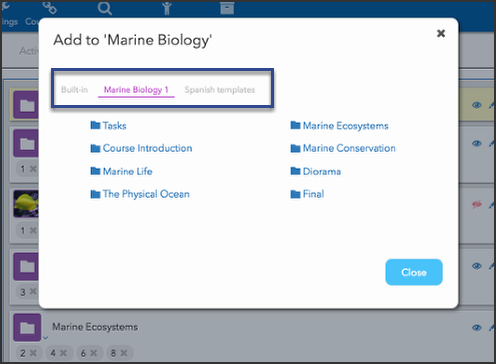 You can now create activity templates for content authors to easily copy to and use in their courses! When activity templates are available, tabs appear when users Add items to the Syllabus (Editor beta). Select a tab to find and copy a template. Teachers: To add activity templates to your course, see How do I add activities to my course? 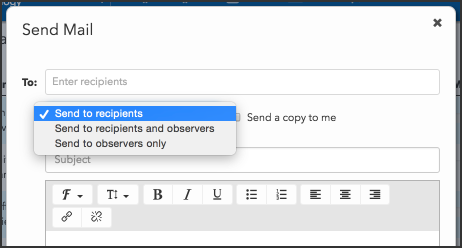 Teachers can now email observers with Buzz. Accessibility: Many updates were made to the Student and other apps to improve accessibility for users with a visual impairment. While many of the updates were under-the-hood, users may notice improved keyboard navigation throughout multiple tools and slight style changes to selected and focussed buttons and menu options. Editor (beta): Improved render times for the next/previous month buttons in the Sheduling tab. Fixed an issue where Enrollment External IDs would not update when running batch imports. Fixed an issue where items did not indent in the list view of the Calendar. Fixed an issue where errors when saving domain blackout dates would not be reported to the user; the function would just fail silently. [IE11, Chrome] Fixed an issue where course icons were being stretched in the Performance tool. Fixed an issue where the category checkboxes in the Grade Scheme Editor wouldn't display checkmarks when selected. Fixed an issue where a selected self-assigned student task would continue to appear in the Activities tool main frame after being deleted. Removed unwanted linebreaks in the Managing Grading Schemes window (Performance tool). Fixed an issue where images would not preview in the Grade Editor. [Firefox] Fixed an issue where editable fields in the question editor were not large enough to make changes. Fixed an issue where navigation buttons and page breadcrumbs would duplicate themselves in the Projects tab when toggling views. Fixed an issue where users could import content that was set to "Hidden from Editor" from the Library, so when imported, it would not appear. FIxed an issue where project icons would not wrap correctly and then overlap in the Projects tab and Course Home pages. Removed unneccessary activity types from the activity filter (Lesson and Shortcut). Modified Editor to allow choice activity previews. Removed the eyeball (hide/show) icon from Choice Activities folders because they are always visible when they're present. Modified activity editors so that the Passing Score field in the Gradebook tab no longer transitions into a mandatory field after being edited once. Fixed some alignment and other display issues that appeared in the course blackout date selector. Fixed an issue where choice activities would disappear from the Syllabus after the user added them to the choice folder and refreshed the page. Fixed an issue where objective indicators would erroneously appear on activities in the Syllabus. Revised the Scheduling tab's list view (under the calendar), so it would accomodate multiple activities better when used on smaller screens.